Three fire crews attended the blaze last night. A fire has ripped through a recently refurbished Fife scout hall causing extensive damage. Emergency services were alerted to a blaze a\t the 4th Fife Scout Hall in Carenden shortly before 9pm on yesterday evening. Police remain at the scene morning after a blaze ripped throught the building in Cardenden. 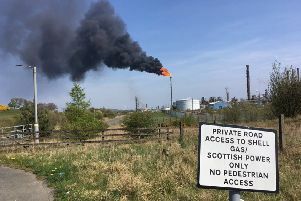 Two Scottish Fire and Rescue Service crews from Lochgelly, as well as one from Dunfermline attended the scene while police closed the road for several hours as fire crews fought the blaze until the early hours.. The fire is thought to have started in a store room before spreading to the main hall area. Police officers remain at the scene this morning, with an assessment of the damage to be carried out later today. A spokesman for 4th Fife Scout Group who are based at the hall said: “As many of you may be aware, our hall was on fire this evening. “We are understandably devastated and it is too early to assess the full extent of the damage to the building or the cause of the fire itself. “Please be patient and we will update our situation as soon as we are able to put a plan in place for each section.